Travel can be an amazing amount of fun. There’s the opportunity to try new food, see new sights, meet new friends, and make lifelong memories. Many people have world travel on their bucket list. Travel is a goal for them. The bane of travelers everywhere is also known as jet lag. It messes up your wake-sleep cycle. It can cost you big in terms of time and enjoyment. It can take a couple of days to recover from the flight so you can enjoy your trip. Then there’s the flip side of that reaction. You’ll be so excited to be on your vacation or on the trip that the adrenaline will keep you going when you get there, only to crash later at the most inopportune time. But that’s not all! When you get back, you plan to come back early. You don’t even think of heading straight back to work. You’ll be too tired to think you’ll be any good at what you do. It’s a fact that some people recover from jet lag easier than others. A six-hour time zone change can take some people up to seven days to recover. It’s generally worse, too, when you’re heading east than when you’re heading west. What has happened is the sleep/wake cycle has shifted too rapidly for the internal circadian timeclock to keep up. 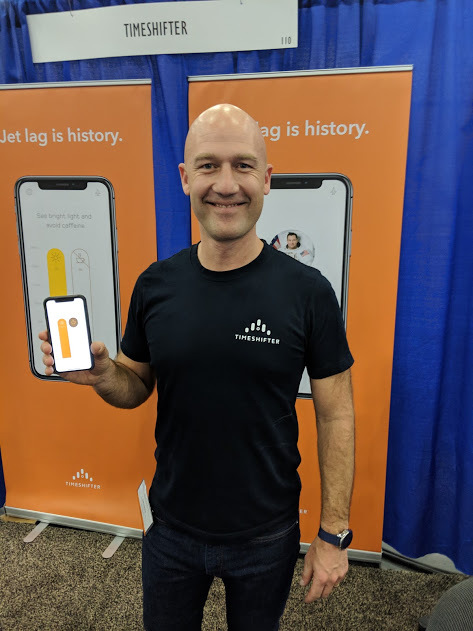 It doesn’t have to be that way, Timeshifter app developer Mickey Beyer-Clausen says at the National Sleep Foundation Sleep Show in Houston earlier this month. By making small adjustments during the flight, you can arrive acclimated to the time zone ready to go on with your day, Beyer-Clausen says. The app advises on patterns of light exposure and light avoidance to combat jet lag. “It tells you when to look at your tablet computer and when to be in darkness,” Beyer-Clausen says. There is a use for the blue light coming from your portable device. If you have a blue-light blocker on, you’d want to remove it if you need to expose yourself to light at a certain time during the flight. What can mess up your ability to sleep sometimes can actually help you in this situation. “You’ll also use a dose of melatonin at the right time to speed your adaptation,” he adds. The dose should be no more than 1 mg.
Melatonin is a naturally occurring hormone that lets someone know when it’s time to go to bed. It’s not a sleeping pill. The app costs $9.99 for a one-time-use plan. For more frequent travelers, it runs $24.00 for a year. Entrain, developed by researchers at the University of Michigan, is a jet lag app alternative. It approaches jet lag as a math problem. It’s available for both the iOs and Android systems. Timeshifter is backed by astronaut investors as well as investors from the airline industry, Beyer-Clausen says. There are plans to include a jet-lag avoidance plan complementary to luxury-class passengers on certain airlines. “There’s a lot of opportunity for people to benefit from this,” he says.